I have created a monster in introducing the girls in my family to Chicken Liver Pate. They love it. They eat it by the spoonfuls or spread thickly on sandwiches. I am still trying to teach them to eat this is moderation. The men? Not so much. My son's reaction: "That is not even food". Cory's reaction after the tiniest little tongue touch to the spoon: "Nope. Nasty!" Rye and I had this to say, " AWESOME! MORE FOR US". I am okay with it. My feelings are not hurt because Chicken Liver Pate is not loved by my whole family or by most people for that matter. I did encourage them to try it because homemade taste better than store bought. Not to be snobby but I can't bring myself to eat pate that has been sitting on the shelf. I am sure it has been properly preserved but I believe this is something that you should make from scratch and definitely eat while it is still fresh. I have made this batch and frozen small cookie scoop sized balls for later uses. What can you use it in besides eating it plain? Lots of stuff. Liver is full of micronutrients that many of us miss out on and it has been recommended to eat organ meats twice a week. Here is a link to read more about eating organ meats. I have learned so much from Paleo Mom and trust her comments, advice and philosophy. I highly recommend that you do your own research and listen to your doctors and your body. 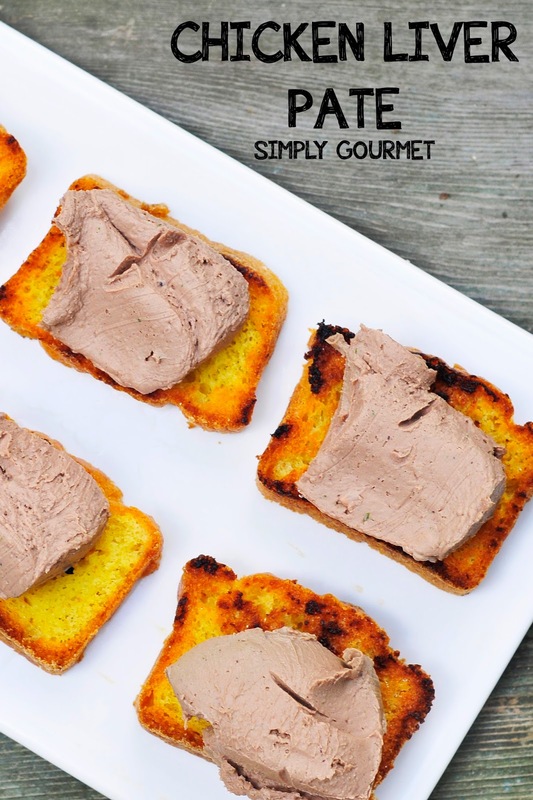 Chicken Liver Pate is a high calorie food and should not be eaten every day. A little goes a long way is how I look at it. I feed about a teaspoonful to Finnley twice a week. She is almost one and eats very little meat. This is a way that I can introduce her to a new flavor and know that she is eating something that is good for her. I have been reading about various ways that you can use liver pate in recipes without eating it by the spoonful. This is especially good to know when dealing with a few family members that won't eat it straight "as is". The suggestions that I am going to try are adding a small amount to hamburgers, adding some to meatloaf and soups/stews. The flavor is masked but the benefits are still included. I had several neighbors test and taste the pate. I wanted to make sure that the flavor profile was right. My friend Jennifer said it was smooth and she liked the subtle undertone of the addition of the cooking wine. I am hoping to get a few more livers (rabbit from a friend) and try some new pates in the future. The pate is easy to make: you saute the veggies, cook the meat, add your spices, blend in a high speed blender until smooth, add your butter/ghee and cream/coconut cream, taste and re-season and you're done. 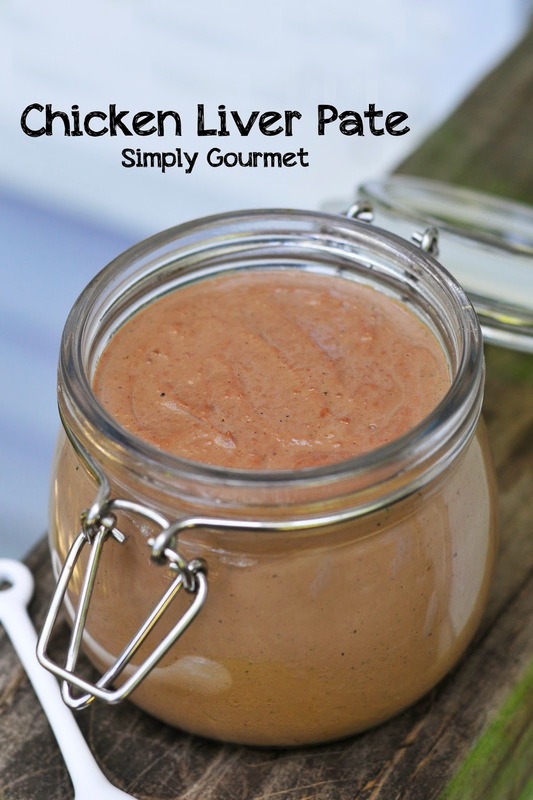 It is not hard and if you enjoy pate this is something you will want to try at least once to make in your home. I am thinking with the holidays coming up that this is a great appetizer to share with a gluten free cracker or fresh vegetables. 1. Melt 1 tablespoon of ghee in a cast iron pan. Add the onion and saute for 3 minutes. Stir in the fresh parsley. Remove from heat and add to a high speed blender or food processor. NOTE: I used my Vitamix and my pate is very smooth. 2. 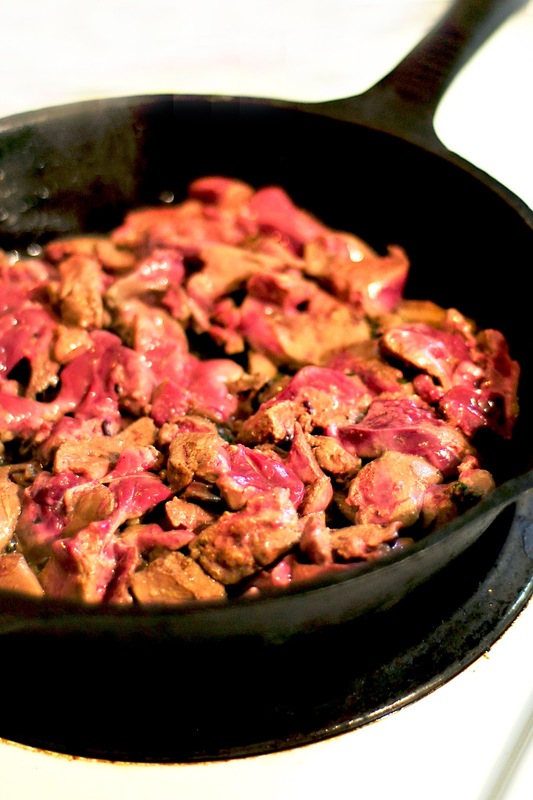 Slice livers and saute them in the same cast iron pan that you used for the onions. Add cooking wine and continue cooking for 3 minutes. Two ways of doing this. Cook until the liver centers are pink OR cook until done (no pink). You decide on how comfortable you are eating undercooked chicken livers. The first option will give you the pink color. I cooked mine until completely done because I have kids eating it at home. 3. Remove liver from stove and add to the high speed blender. Add 1/2 a cup of ghee, coconut cream, salt and pepper. Blend until smooth. 4. This is the where you get to decide how it taste. My recipe is just a basic blend. If you think it needs more salt--add more salt. More wine--add more wine. Smoother --add more cream or butter. 5. When your pate is JUST RIGHT for you and your family it is ready to be chilled. Find a container with a tight lid and grease the inside. I used ghee. Pour pate. Add a piece of plastic film to the top if you do not want a skin to appear. Let chill for at least 3 hours. 6. The shelf life is short this is why I would recommend that if you don't use it in days, freeze it. To freeze just put into a freezer safe container, add your date and freeze. Good for 3 months.